MICHAEL Whitney was an opportunist. He just happened to be playing county cricket in England when all of the Australian bowlers went down with injury during the 1981 Ashes tour. He got the call up to fill in and play for Australia and he grabbed that opportunity with both hands, turning it into an Australian international cricket career. Talk about timing!! 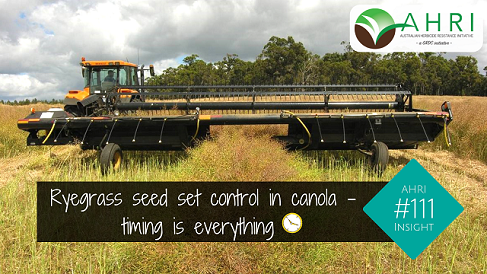 Stopping ryegrass seed set pre-harvest in canola is all about timing. Sometimes the timing window lines up, other times it does not. Western Australian Department of Primary Industries and Regional Development grains development officer, Glen Riethmuller, Merredin, has a knack for choosing the most difficult, most labour-intensive research trials to undertake. Between 2010 and 2013 he, along with Abul Hashem and Catherine Borger, investigated ryegrass seed set control pre-harvest in canola. They investigated the practice of spraying under the swather as canola is windrowed for harvest compared to crop topping (desiccation) spraying over the top of the canola. At the time glyphosate was not registered for this practice and this research contributed to this registration. For this reason these research results were not made available until after the registration process was complete. The researchers found that glyphosate can be effective either as a spray swath or crop topping treatment and that the other registered herbicide, Reglone (diquat) is sometimes effective when the ryegrass is at the right stage but results were variable. They also tested the unregistered practice of paraquat sprayed under the swath and found paraquat residues in the canola grain despite the herbicide being applied under the swath. Paraquat is unregistered and is not an option for seed set control in canola. Sometimes all of the ryegrass seed set control treatments work, sometimes none of them work. Timing is everything. Spraying under the swather as the canola is windrowed for harvest has become a common practice in Australia to stop seed set of ryegrass and other weeds. This has become particularly important to help control late emerging weeds. As with crop topping, timing is everything with spray swathing. 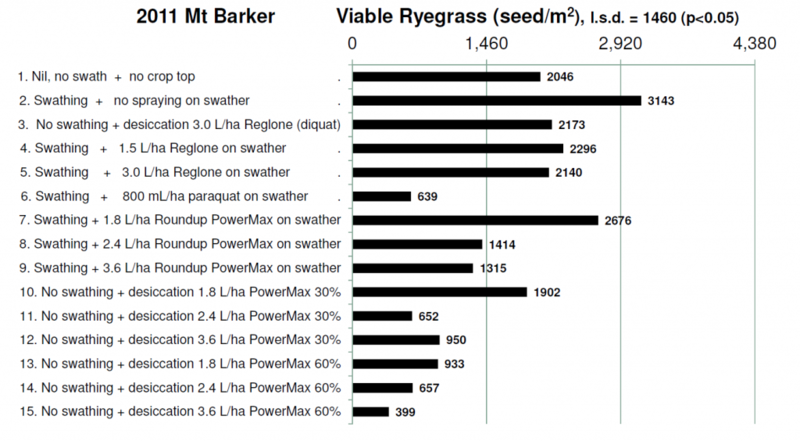 The results of this trial were not particularly exciting with roughly 50 per cent ryegrass seed set control achieved with many of the treatments. What it does show is that spray swathing and crop topping (desiccation) can be equally effective as one another. Desiccation with Reglone (diquat) was quite effective in this trial, reducing viable ryegrass seed production by 65pc but Reglone under the swath was less effective. 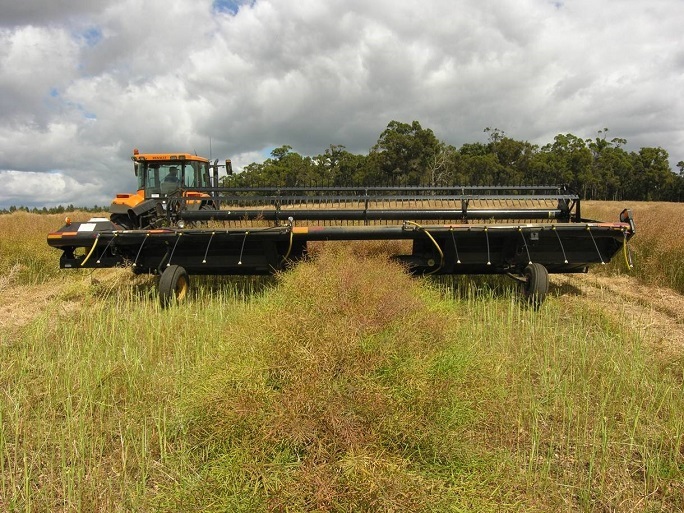 Swathing alone gave about 43pc ryegrass seed set control, similar to the level of control achieved with the glyphosate treatments. The 2011 trial at Mt Barker showed that glyphosate applied as a desiccant at high rates late was generally more effective than the spray swathing treatments. On average, spraying under the swather with glyphosate reduced viable ryegrass seed production by 43pc whereas the best desiccation treatment with glyphosate achieved 80pc ryegrass seed set control. Desiccation treatments: 3.0L/ha Reglone + 0.16pc BS1000, 1.8, 2.4 and 3.6L/ha of Roundup PowerMAX at 11km/h with eight Lechler IDK120-02 air inducted nozzles, 50cm apart, 2.5 bar, 730mL/min = 80L/ha. Desiccation and swathing treatments applied on 28 November 2011 at 80pc colour change of the canola. You may notice a gap in the graphs above, that was the unregistered paraquat treatment. Many have argued that perhaps we should be able to spray paraquat under the swath because it is sprayed below the swathed canola and should therefore not enter the grain. The data below is from the paraquat sprayed under the swath treatment. The MRL (Maximum Residue Limit) for paraquat is 0.01ppm so the residues found in reps 2 and 3 are well in excess of this. Paraquat is not registered for canola pre-harvest and is not an option. Several years ago I was visiting farms in spring giving recommendations to grain growers about crop topping of lupins for ryegrass control. Some paddocks were good to go with milky dough ryegrass and lupins at the right stage, and other paddocks just down the road were not. The ryegrass was past the ideal timing. The same is true for crop topping of canola. Sometimes the timing window opens up and other times it does not. In 2012 nothing worked. 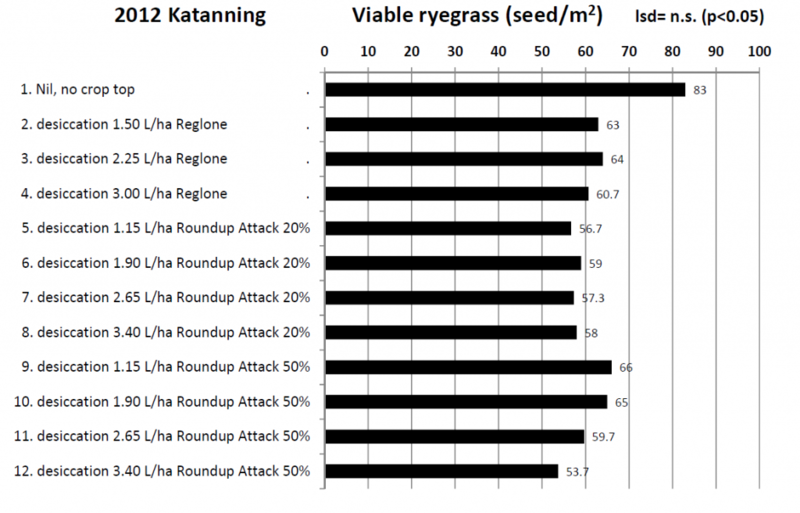 The 2012 Katanning trial had low ryegrass numbers and the researchers commented that the ryegrass appeared too advanced at the time of spraying for crop topping treatments to be effective. The results below show that all treatments were ineffective. Reglone (diquat) desiccation treatments applied at 80pc colour change of the canola. Roundup Attack treatments applied at either 20pc or 50pc colour change. The ryegrass was at the ideal timing as the canola seed changed colour in this trial and everything worked, even Reglone! This trial also included some different water rates which had no effect on efficacy. 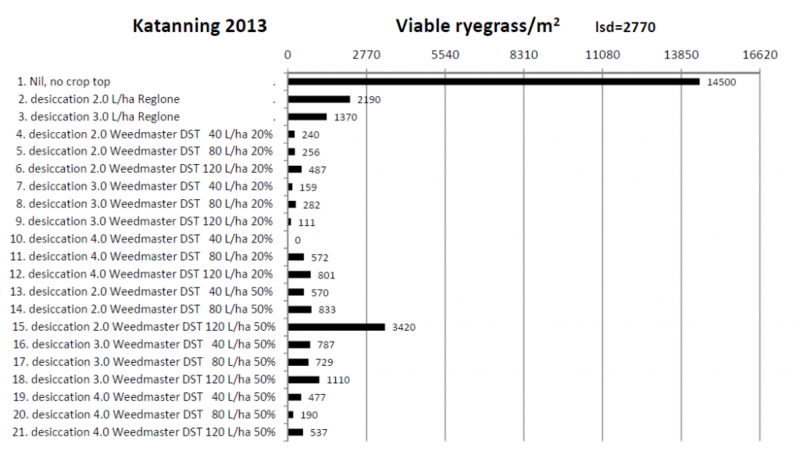 The 2013 Katanning trial included three water rates of 40, 80 or 120L/ha applied at either 20pc or 50pc colour change of the canola. Reglone treatments applied at 80pc colour change of the canola. Paraquat is not registered in canola, and diquat is often ineffective at this late timing. If the ryegrass is flowering to water ripe, diquat may be an option, but more often than not it seems that glyphosate will be the product of choice for pre harvest weed seed set control in canola. Clearly this represents significant selection pressure for glyphosate resistance, which is why Greg Condon has coined the term the ‘Canola Combo’. That is the double knock of glyphosate applied as a crop topping or spray swathing treatment followed by harvest weed seed control. Sometimes the crop topping or spray swathing timing lines up perfectly and the weeds are at a vulnerable stage when the crop is ready to be sprayed and / or swathed. In this situation it almost doesn’t matter what you do, almost everything works. In other situations, however, the weeds are very advanced when the crop is ready and nothing works particularly well. Crop topping (desiccation) and spray swathing of canola are excellent practices when the timing window is open.